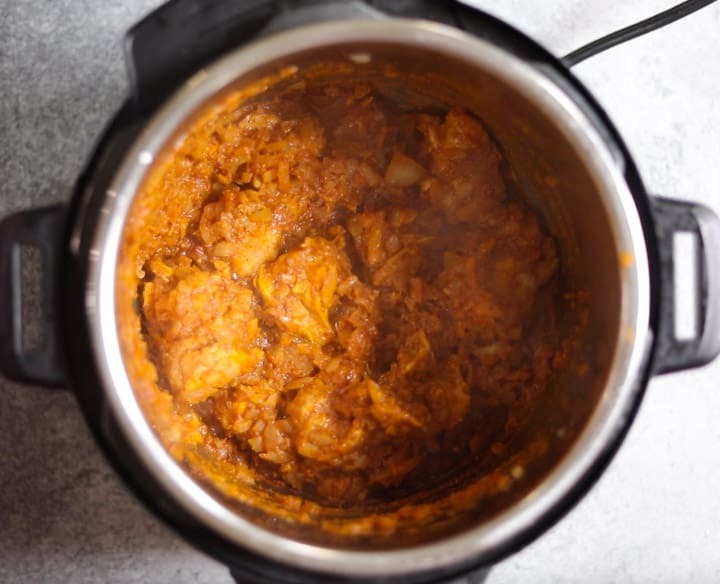 Authentic Goan Chicken Vindaloo made in the Pressure Cooker or Instant Pot. 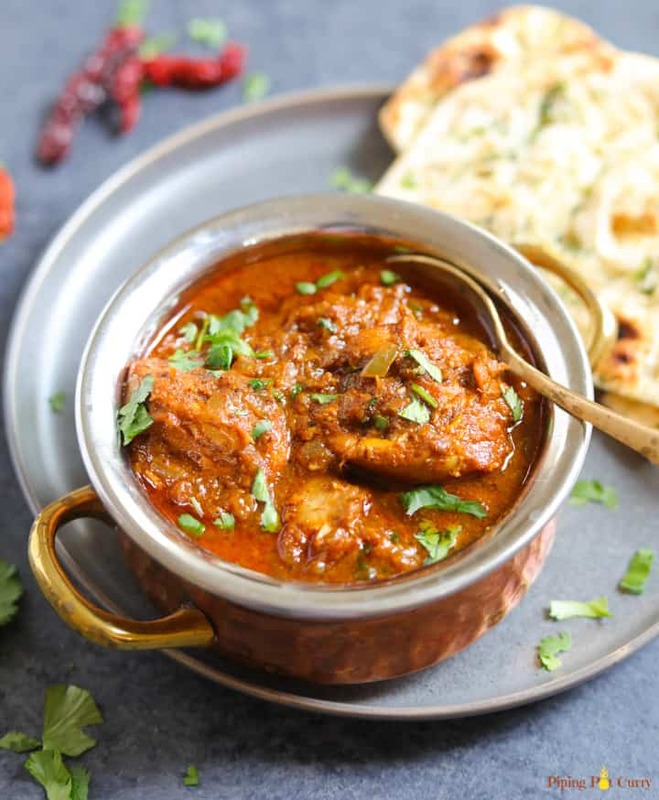 Vindaloo is a traditional Goan curry which is made with meat cooked in onions, ginger, garlic, along with lots of aromatic whole spices and the tanginess of vinegar. Enjoy this dairy-free and gluten-free Chicken Vindaloo with rice or naan for a satisfying dinner! Vindaloo is a popular curry to order at restaurants, similar to Chicken Korma or Chicken Tikka Masala. The most common version of this curry is made with pork, however we will change it up and make Chicken Vindaloo. Authentic vindaloo curry gets all of this flavor from chicken marinated in the freshly ground whole spices. So don’t skip that step when making this delicious curry! We loved this Chicken Vindaloo. My daughter who is super fussy and does not typically like much spice in her food, devoured this chicken. She just cut it into pieces and enjoyed with a fork. 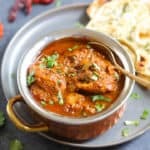 So I am sure you will love this Chicken Vindaloo! Vindaloo (pronounced vin-duh-loo) is an Indian curry dish from the region of Goa. This spicy and tangy curry was introduced to the region by Portuguese sailors. Vindaloo comes from carne de vinha d’alhos, which literally means “meat in garlic wine marinade”. This was “Indianized” by the local Goan cooks with the substitution of vinegar for the red wine, and the addition of dried red chili peppers with additional spices. Vindaloo has become synonymous with ‘super hot and spicy curry’. However in reality this curry is not the most spicy. Yes, we add lots of spices, however it does not have the heat as some other curries. 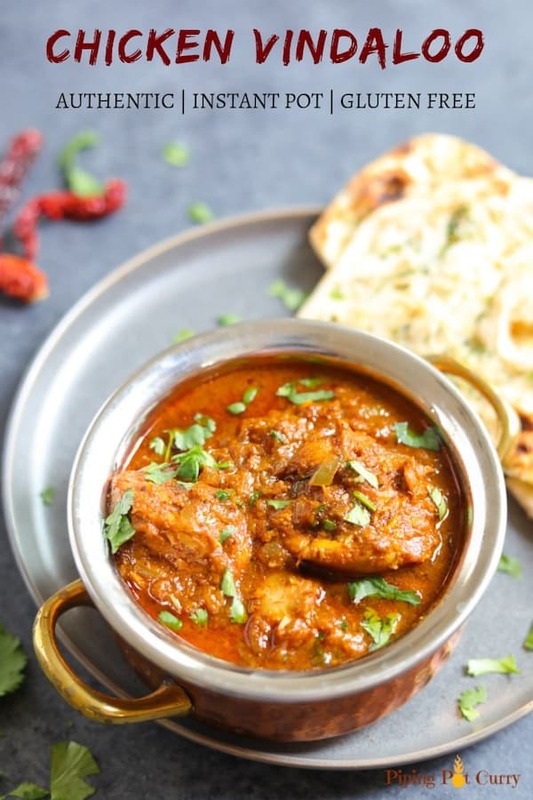 Traditionally, Vindaloo is eaten with pao (similar to dinner rolls), however now people around the world enjoy it with naan, rice or any Indian flatbread. Vindaloo is a very spicy curry – Vindaloo curry gets a lot of this flavor from the whole spices that are blended to make a vindaloo sauce. With these whole spices, dry red chilies are added. However these chilies do not make the curry very hot. I like to add dry Kashmiri red chili's when making Vindaloo sauce. These chilies give a wonderful red color to the curry, but are mild. You can definitely add more or another variety of red chilies to make the curry spicier. Vindaloo has the word “aloo” in it. “Aloo” means potato in Hindi. You will find that many restaurants add potatoes to vindaloo curry. However the traditional recipe for vindaloo does not have any potatoes in it. 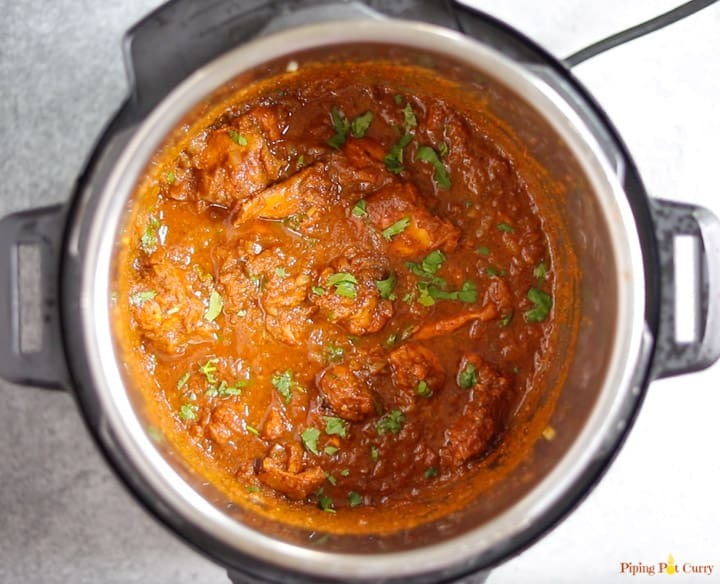 How to make Chicken Vindaloo in Pressure Cooker? Now let’s see how to make this delicious vindaloo curry. If you are new to the instant pot (pressure cooker), check out this Instant Pot Quick Setup Guide to get you started. 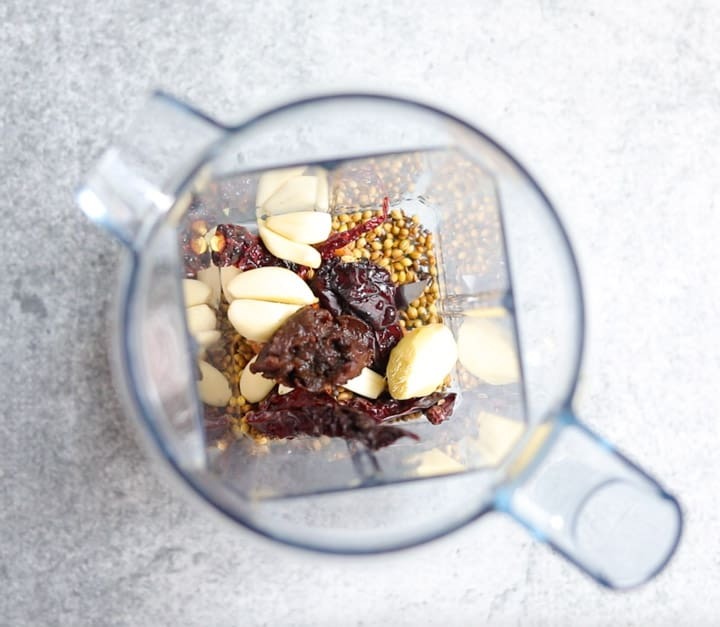 Start with adding the dry whole spices to the pressure cooker – dry red kashmiri chilies, coriander seeds, cloves, cinnamon, cardamom, peppercorns, cumin and mustard seeds. Turn on the pressure cooker on sauté mode and give the spices a stir. Sauté for about a minute until they are fragrant and slightly browned. Make sure they do not burn. 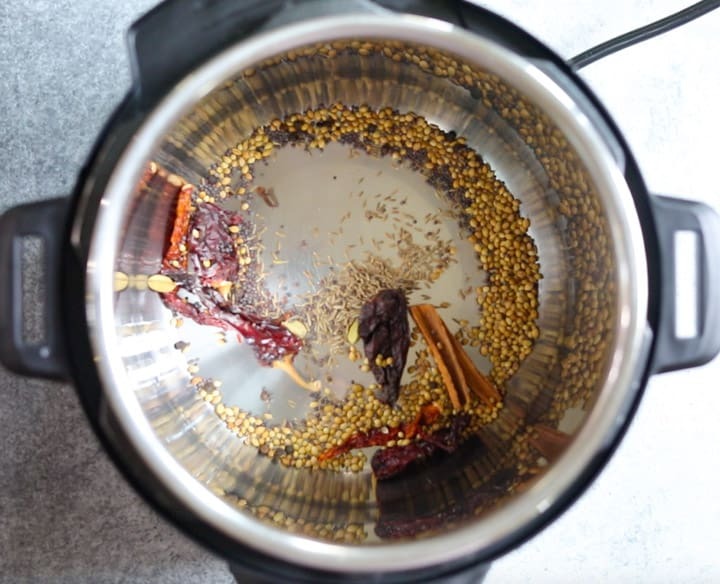 Transfer the whole spices to a grinder. Add ginger, garlic, tamarind paste and vinegar. Vinegar adds a wonderful tangy taste to the curry. I used rice vinegar in this recipe. Grind to make a smooth paste. I added about 3/4 cup water when grinding. Cube chicken thighs to about 2 inch in size. Add the ground curry paste to the chicken. Mix well and refrigerate for 15 minutes to overnight. Start the pressure cooker in sauté mode and heat oil in it. Add onions and saute for about 4 minutes until they turn golden brown. Then add turmeric and salt. Add the marinated chicken and saute for 3 minutes, while stirring frequently. 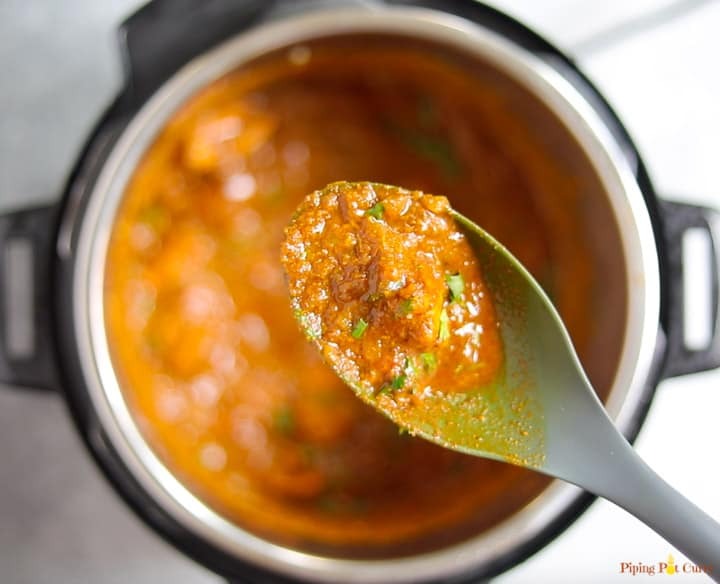 Mix in any remaining vindaloo paste from the marinade in 1/4 cup water, and add to the pressure cooker. Deglaze the pot. Make sure nothing is stuck to the bottom. Pressure cook for 5 minutes, then do a 5 minutes NPR. This means after the pressure cooker beeps, let the pressure release naturally for 5 minutes, then do a quick release manually. Add brown sugar and stir in the curry. Look at that color! Doesn’t it look gorgeous? My daughter who is super picky, devoured this chicken. She did not even bother to dip the naan in it, she ate the chicken with a fork. √ Perfect to enjoy even on weeknights! 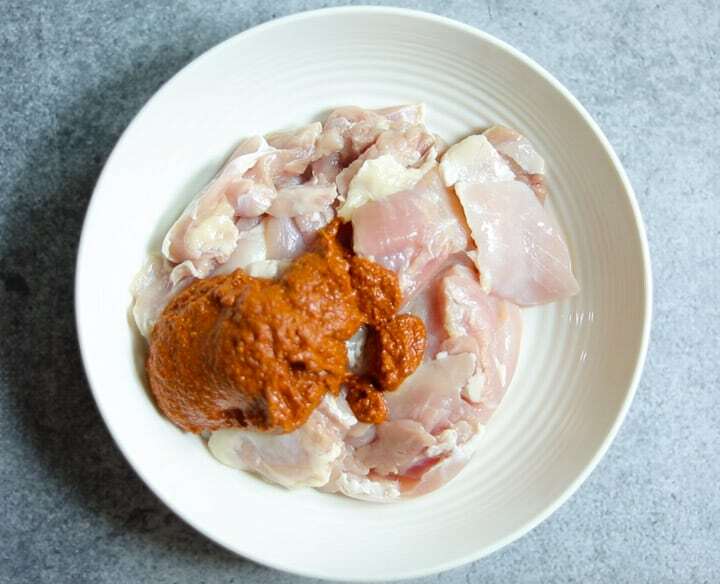 Give this Chicken Vindaloo a try and do share how it turns out! Authentic Goan Chicken Vindaloo made in the Pressure Cooker or Instant Pot. Enjoy this dairy-free and gluten-free Chicken Vindaloo with rice or naan for a satisfying dinner! Turn on the pressure cooker on sauté mode and give the spices a stir. Sauté for about a minute until they are fragrant and slightly browned. Make sure the spices do not burn. 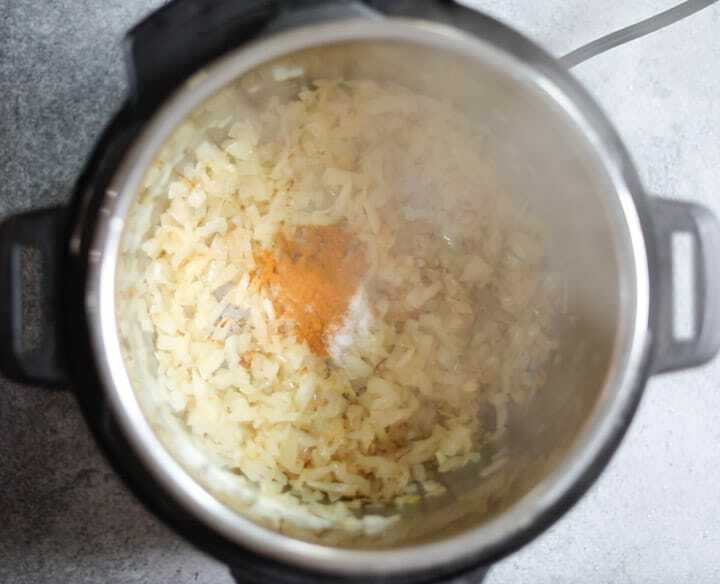 Transfer the whole spices to a grinder. Add ginger, garlic, tamarind paste and vinegar. Add 3/4 cup water and grind to a smooth paste. Add chicken pieces to a bowl. Add the curry paste to the chicken. Mix well and refrigerate for 15 minutes to overnight. Add turmeric and salt.Add the marinated chicken and saute for 3 minutes, while stirring frequently. 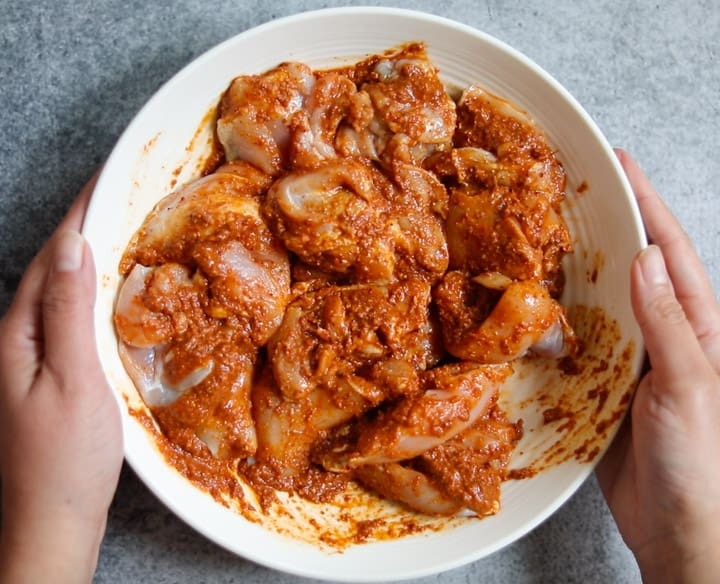 Mix in any remaining vindaloo paste from the marinade in 1/4 cup water, and add to the instant pot. Deglaze the pot and make sure nothing is stuck to the bottom. Garnish with cilantro and serve hot with rice, naan or roti. Pot-in-pot rice: You can make pot-in-pot white basmati rice along with chicken vindaloo in the instant pot. So glad to hear you enjoyed the Chicken Vindaloo. Thank you for sharing back your review! Since I’m plant-based I’d like to eliminate the chicken and use soy curls instead. Do you have any idea of how long to cook the soy curls. When I make BBQ soy curls in the Ipot, I use the slow cooker function, but I’d like to use the pressure instead. Any ideas? Also, if I use chickpeas instead, how long would I cook it (preferably dry chickpeas, but I also always have cooked ones on hand.) Thank you…I love your recipes that I can adjust to plant-based (no-oil). Hi Janet – I have not cooked much with soy curls, so it is hard for me to suggest the cooking time for that. I see a recipe from Vegan Richa which suggests 8-10 minutes on high pressure. You can use dry chickpeas in this recipe. Soak them for about 4 hours or overnight. Then use them in the recipe and cook for 30 minutes high pressure (or bean/chili mode). I would love to hear if you try it! Ooh, chickpeas sounds wonderful too. Thanl you! Hi, how did u get the red color? Hi Anchit – The red color is due to the Kashmiri red chilies added when making the paste. Kashmiri chili’s are not too spicy but give a wonderful color to any curry. Hope you enjoy it! Hi. This is one of my favourites at the Restaurant. I don’t have access to the whole Kashmiri chilies where I live…only the powder. How could I substitute? Hi Kellie – Try with 1.5 tsp of Kashmiri Chili powder initially when making the paste. Then based on the taste once the curry is cooked you can add more and give it a quick boil. I hope you enjoy this one too! What can you use instead of a grinder? Unfortunately I don’t have one. Thanks! Can’t wait to try it!! Hey Deanna – You can also use a powerful blender too. I have tried making this paste in the Vitamix blender and it worked well. I would love to hear if you try the curry.